This is the bag that underpope’s evil surprise is coming in. 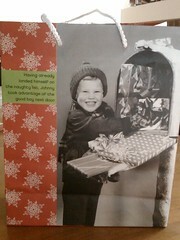 Isn’t it the most awesome gift bag ever? Oh, you want to know what’s in it? Patience, my friends, patience. There will be photos.